(NewsUSA) - For many, enjoying their outdoor space includes a poorly lit patio or deck with spartan, uncomfortable furniture, devoide of real style. According to the American Lighting Association (ALA), outdoor living can be just as captivating, high-tech and chic as life inside your home. Regardless of the season, it is becoming common to turn a patio, deck or outdoor space into an additional family room with modern amenities and beautiful furnishings. ALA-member lighting manufacturers are making this transition easier with expanded lines of decorative lighting rated for all-weather use. 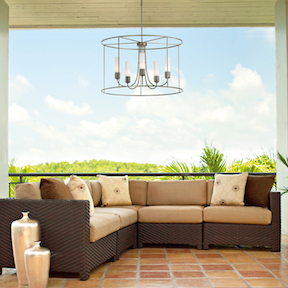 Hinkley Lighting's CEO Rick Wiedemer, CLC, explains how the trend of accessorizing outdoor areas with traditionally indoor lighting products has gained momentum over the last several years. "It started with landscape lighting and then moved into sconces, wall sconces, and now pendants and chandeliers," Wiedemer says. It's fairly commonplace to use sconces to highlight doorways and step lights to define spaces; today's homeowners are also hanging elaborate chandeliers and colorful pendants over outside tables. Spotlights can be seen above grills and downlights under covered patios. With a little creativity and imagination, just about anything goes. And the demand is increasing for those fixtures to mimic the styles and attention to detail traditionally found indoors. "People want to extend their indoor living space outside, and still have the same quality of finishes outside as inside," says Rick Seidman, president and CEO of Quoizel, Inc. "They're putting rugs, televisions and furniture outside, so we almost have to treat [outside] decorative lighting as if it's interior." Just because the newest outdoor lighting fixtures are beautiful, don't assume they lack the engineering to withstand harsh temperatures and extreme weather. High-quality outdoor fixtures are designed for reliability and endurance. "One of the things consumers are concerned about when shopping for lighting is durability," says Seidman. "It really has to be able to withstand the elements. With new technology, fixture finishes are actually built into the material so that it weathers beautifully." Wiedemer concurs. "You want to have something that's meant to be in the weather. Normally a rustic finish fixture will weather better," he says. "The principal thing these are engineered for is to be rained upon. Rain will not collect inside the fixture, it will drain out…. A typical interior fixture is not made that way." The latest all-weather lighting is at your local ALA-member showroom. For a listing of showrooms or to view outdoor lighting videos, go to americanlightingassoc.com.